Zombies And Toys: Another Zombie Attack! Not really, just another hacked sign. I don't condone hacking these things but hearing and seeing it always brings a smile to my face. Actually, the biggest hazard is my constantly checking when I drive by one to see if it's hacked. 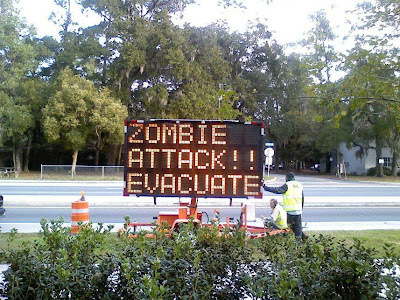 Two signs were recently altered to read, "ZOMBIE ATTACK!! EVACUATE" in Gainesville, FL. Federal Department of Transportation spokeswoman Gina Busscher reported, "we've not seen any zombies on University Avenue."